In the hot days of the season, pet owners should be aware of some of the dangers that the summer can bring for their animals. Taking a few simple precautions can make summertime living easier for pets and pet owners alike, advise veterinarians at Colorado State University’s Veterinary Teaching Hospital. Outdoor pets should be provided plenty of shade and fresh, cool water. When temperatures really soar, put a few ice cubes in the water bowl. Make sure your outdoor pets can find some shade. 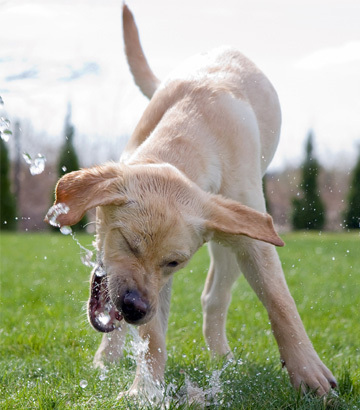 Consider a small children’s wading pool for the yard as a way for the dog to cool down. Never leave your pet in a closed vehicle on a hot day. It doesn’t have to be very warm outside for temperatures in a closed vehicle to reach over 90 degrees F in just over five minutes and more than 110 degrees F in less than half an hour. If your pet displays symptoms of heat stroke, prompt medical attention is important. Symptoms of heat stroke include panting; dehydration; warm dry skin; failure to respond to commands; rapid heartbeat and collapse. First, move the animal to a cool place and offer plenty of cool water. Read instructions carefully when using fertilizers, insecticides and herbicides in your gardens. Summer time is good for gardening, but many of these products may be harmful or even toxic to animals. Dogs and cats can become dangerously ill after ingesting product residue by eating freshly treated grass or licking it off their paws. Many garden and houseplants may cause irritation, illness or death if ingested by pets. Some of the more toxic include tulip, daffodil, and iris bulbs, azaleas, amaryllis, dieffenbachia and philodendron. Train your pets so that houseplants and specific areas of the garden are off limits. Don’t worry if your pet eats less during hot periods. Unless other symptoms are evident, your pet will usually eat less during very hot weather. Just make sure plenty of fresh water always is available. Tick infestation. Regular grooming is important in helping to control these pests. If dogs or cats have been in fields or wooded areas, check ears, bellies, armpits and base of the tail carefully. Footpad problems can be caused by hot gravel, pavement or sticky asphalt. Be aware that paws can be burned or damaged. To remove tar, rub footpads with petroleum jelly then gently wash with a mild soap and rinse thoroughly with cool water. Never use gasoline or kerosene to remove tar — these chemicals are highly toxic. Puppies, kittens, obese and geriatric animals are more susceptible to warmer temperatures. Longhaired cats, short-nosed breed dogs and pets with respiratory disorders are also more susceptible to heat stress. So take steps to be sure that they are kept cool. Short summer clips and sunburn. Many dog owners — and some cat owners — like to give their pets short haircuts during the hot months. This doesn’t necessarily ensure a cooler body temperature and could cause your pet to become sunburned. Keeping your dog and cat well groomed is important, but a very short clip isn’t a good idea. In some parts of the country, it is important to also check for plant and seed residue. Many seeds find their way between your pets’ toes or into your pets’ ears and nose and can create serious problems. Check with your veterinarian for local plants which could present problems. Rattlesnake bites. Dogs are usually bitten by snakes from May to September while on walks with their owners. Bites from rattlesnakes cause pain and severe swelling. Some dogs, especially small dogs, may go into shock. Mosquitoes and heartworm disease. Dogs and cats are susceptible to heartworm. Have your veterinarian check your pet for heartworm as well as other internal parasites. If you live in a high infestation area, ask your veterinarian about a heartworm prevention program. You dog’s safety depends on you. Keep that in mind this summer when you and your dog are out enjoying the sun.